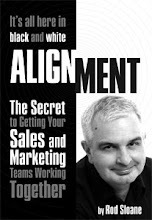 Sales and Marketing Alignment Blog from Rod Sloane: How do you know if your Marketing People are doing a good job? How do you know if your Marketing People are doing a good job? It’s easy to tell if a sales person or account manager is doing a good job, you simply ask… are they making their numbers. It’s easy to tell if a business development manager is effective, are they building a pipeline of quality opportunities. So what about marketing? How do you if a marketing manager is doing a good job? If you ask them to organise events and brochures without any day to day contact with business development and sales, I am going to suggest that it is virtually impossible. Is that a big claim? Recently, I was talking to a Marketing Manager of a global software company. He had responsibilities for events, big global events. Any opportunities were then scooped up by sales and BD. If the business was won, then it was down to the brilliance of sales. If no sales were made then obviously marketing had put on a lousy event. There was no communication between sales and marketing. No Alignment. Not so much Mind The Gap as Grow the Gap. Now, when I asked this Marketing Manager, who wanted to contribute to the Company’s overall success, how he was judged on whether he was doing an effective job, he said nothing. He just shrugged his shoulders. Sad, isn’t? Now, I am not looking to point any fingers. If companies choose not to align their sales and marketing, not only are they missing out on opportunities and revenue but they are probably misallocating their scarce marketing resources. And the most expensive resource they are wasting is the talent of their marketing staff.